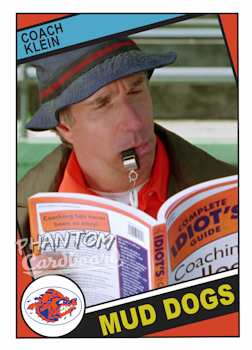 Here's my Coach Klein card from The Water Boy. This is a movie that came out in 1998, and as far as card design goes, that's way out of my wheel house. Instead I chose to go with the 1984 Topps football design. One, because I wanted a design that called for a logo so I could utilize the SCLSU Mad Dogs logo, and secondly I already had the template created from using it to make Revenge Of The Nerds cards. Here's my autographed copy. I'd love to make more cards from this movie but as of now it seems as if Henry Winkler is is the only reliable TTM signer.